I joined the game a few years back, because it was free and had aaaaall the cars. But back then, I only had a keyboard, and SRW was very buggy with my computer. So I kinda gave up at the time. But two years later I finally bought an SRW S-1, so I got back in the game. I started hotlaping the F3/Sonoma event like a mad man, as I felt I could be pretty competitive there. After more than 4,000kms of testing, I succeeded in entering the Free To Play championship on this combo. My first championship race! I was one of the slowest guys on the top split, had an horrific first lap and finished 10th. But being in an official race, with very fast people, live on YouTube, that was totally amazing. It was very, very intense, an awesome feeling. A few weeks later I got into another official race, MP4-29 at COTA, and that was very fun too. I quickly learned who everyone was, and how amazing a community SRW had. Seriously, you guys are awesome! I made some good friends online. I remember racing door-to-door with Mausil at Brno with the WTCC. We were 10 seconds from the lead, but we had a ton of fun. Recently Elsydon started a team made of friends, and I was invited. I remember saying that we wouldn't have any trouble finding members, as everybody here is so friendly! Sure, we all are different, come from different places, like different cars, etc. But the fact that SRW has brought all of us together like that is remarkable. And of course, early this year I starting writing the reviews. What game can offer such a wide variety of cars? And at such a low price? I feel like I've been doing this for ages, but I haven't reviewed a third of what SRW has to offer! I love feeling how different every car is, being surprised because one car is way better than what I expected, sharing my thoughts with all of you guys. No other sim can offer me this. I love SRW to bits, and I will never give up on it. Right now some events are back, I had a lot of fun with the DW12 at Sonoma. The only thing I can think of, is how to take turn 3 flat. And that's what SRW should be! Also, one quick idea: why don't we all buy something with cash this week? It doesn't matter if it's $3 or $25, it's just to show to SRW people that we are still here, and that we won't give up. We always say that SRW's community is the best, now it's time to show them! If we all do it, they won't ignore us. And it also means some sweet new cars in our garages! I know I'll buy the DW12 and some other stuff with my next $10. Cheers everyone, and bravo Coss, for all you're doing. So, to try and show some balance I suggest some positive action. PLease, if you care enough to get stuck in, email or PM or FB Jonathan Haswell and ask him to explain the dire lack of comms and why he has let us all down. Yeah I'll probably do that as well. I know SRW isn't going well, and I feel like the bosses are doing weird stuff too. Let's try everything we can! So, to show i mean it.... I just FB messaged Haswell to express my disappointment. Surely if he was bombarded by us directly he would come and talk to us? Many of us are totally disappointed by the lack of ANY comms about the games likely survival or not. Cmon, this used to be your baby. If you ran out of cash because of the pdc etc, then just tell us. We are big boys and can take it. Please come on the SRW forum and be straight with us. Your (the company's) lack of comms just shows disrespect and is the reason many have left, quite aside from the pressure poor Coss gets from us as SRW's front (and only) man. Btw, Coss deserves a medal for what he has done for you. Without him YOUR baby would have been dead over a year ago. Get him over to your beloved PDC or something, he deserves a massive bonus!! For the record i'm only resorting to contacting you direct as you seem determined to stay away from the game side of things. Just noticed your in game name after all this time.... Hellooo! Raced against you several times..
And before I get jumped on for saying RIP..... Around 30 people playing in a planet of over 6 billion.....Like I said..ghost ship, for shame. Here's a cpl of videos from early days before the game was encrypted. Well, I think srw was part of my life, at least I think of it like my "home", where I started racing. I have a lot of memories of srw, and simraceway used to be great! It was because of simraceway that I bought my G27! (and now it's with dust) It's because of srw that I was the good driver that I was! It was simraceway that made me feel the adrenalin and the need of racing! And I met a lot of nice people here and made a lot of friends! Now... I don't race very much... neither in other games like Assetto Corsa.. yeah sometimes I play it, but I prefer simraceway. Of course AC has better physics and mods and all that but in srw you had a community that you knew the persons that you were racing with, and that doesn't happen in other games. I'm actually similar to Pedro...I began my simracing attempts right here in SRW, though it all went back in the days of 2009-2010, when SRW was merely a community for rFactor. I got rFactor in 2008 and casually played it offline, first on keyboard, then got a used, crappy wheel to get some touch at wheel control. Then as I had been an rFactor Central user for some time, I saw the ad for SRW and signed up. The rest is history. I did some races but never really had good luck, always at least 1 spin and often retiring. I was extremely happy for winning $5 from my own cup I suggested for SRW_Phil, and it got realized. Though, not with the exact same tracks I suggested, but nevertheless. It should also be noted I got the prize from Brands Hatch, the first race of the cup, which is the track I'm still good at. And today getting prizes is everyday for me, I've improved so much since then. I also were often bullied by both Coss and fratsss (Atze), and I wasn't really happy about that. But I'm very happy to remember those days today, and shut both Coss' and fratsss mouth as I've come a long way. Coss hasn't bullied me today which is a sign, though Coss is an admin now. Prevents him from bullying me. I think I should also feel a little honored to be bullied by Atze who is moving towards motorsports now. As for the new era of Simraceway, I merely installed the game that came out in 2011 but never played it, then stayed still until the end of 2011 when I started spending time on a Finnish multiplayer community (this is when my team was originally born!) Then, along with that, competed in Formula Simracing 2012-2014, making very few appearances in SRW now and then, and in October 2014 I fully returned and now call SRW my home. I just can't go anywhere else. Simraceway is the place I've spent the most time on, and I really like it here. Also staying in certain people's memories is nice. And, in general: I really feel bad that I never spent much time in SRW before (apart from the SRW chat, I was very often there). When I was younger and slower I was so anxious and desperate to get faster and drive with Coss one day. I just didn't think about the long run, only that moment, so I just lost the motivation and let simracing be in 2011, as I had just started it in 2009-2010. Good thing I at least found other places to race at (so simracing would eventually become my passion), but I feel like I should've always stayed with SRW, even while running the other leagues. And it's also ironic that now that I'm finally here, the activity has massively dropped and many good users have left. Nothing has changed: now instead of being anxious and desperate about gaining more speed, I'm anxious and desperate to see the old SRW back! With the beginning of 2013 my life was sorted and i had the time to do things i like. Allways an eye on simracing i asked google to find a game for free. I first wanted to see if i like it – the simracing. The actuell situation feels absolut strange to me. Like a huge meteor is on his way to disroy the earthand the responsebel dont tell the people to avoid a panik. Bud like it is all over in life, there is a point you got to tell the truth because you got the responsibility for the people you gathered around you. You called us to play this game and we did it. Now we got al lot of questions, so please answer'! I don't know what questions are going through the heads of srw when they think about this game. What is the real problem? OK, if you offer a game that's not for free you can't treat your customers like some do it here. The voices here are getting louder and louder. The patience smaler and smaler. Is it necessary???? However, it is time for a statement from the official site!!!!! You can't consolate the guyes here for ever. You want to close the game? Tell us!! You want us to pay for the game? Tell us!! You need X-months to offer us the full service again? Tell us!! You got other problems? Tell us!! Like my father said: You can't hide youself if you put your hands on your eyes and say: im not here. Or putting the head in the sand........... Put your eggs in your pants and talk to the people. I've got the biggest respect for Coss. For sure he's sitting between two chairs and trying to hold the ballance. Good luck to you! I like that dahrec ! "put your eggs in your pants"
I wanna buy you a drink buddy! Could not have said it better Dahrec! We're all tired of driving in the dark here. I wish they would shed some light on what road lies ahead, however scary it is. Head of SRW, do as the man says, and put your eggs in your pants! Yes put your eggs in your pants !!! I'm a bit late on that one but I wanna give an answer to Coss on the what-we-miss/positive-memories thing. I miss the live races. No, I miss the live touring car races. The ones where I was never afraid to spin out, the one where I could abuse the front tires and get away with a late braking & early reacceleration, with these front-wheel-drive cars I adore. I miss the "sorry guys, not tonight, I gotta get home and race". It's been eight years since my last participation in a go-kart championship and it feels great to line up on the grid again with other real drivers. It was exciting to know these races were all but virtual. Live marshalling, points, prizes, ... Qualifying for a live event definitely meant something, especially given the high level of the field. It didn't feel like it was a hobby, a waste of time or just another game. Lately, I told a friend I was a sim racer and he replied "so you're doing e-sport?". That's it, that's exactly it: sport, serious business, worldwide competition, regular training and money involved. Throw in some pit babes and I won't need to leave my desk anymore. Ok, just joking on that one but dead serious for the rest. I miss the importance, regard and consideration given by SRW to the drivers. It boosted my morale at a time I needed it. Regarding the memories, I was about to talk about Liam shouting, yelling and losing his voice live on the mike, but I'll go with another one, dating back from 2012. I was trying to qualify for the first SRW live race -IndyCar at Indy, 40 laps. In a qualification server room, I met two Hungarian drivers who decided to help me because they weren't interested in the first prize anyway -VIP tickets to the IndyCar race in Sonoma. So they drafted with me and I got a better laptime, which ultimately granted me a spot in the final race. This is my fondest memory: two guys I had never met before who had no obligation to help me and stil gave me a hand. I can't remember their in-game names but I know they were regular sim racers and we even talked about Norbert Michelisz Thanks, guys, that's the SRW spirit. What can I say, people? You totally ROCK! And if i think of it that was just the preparation part the most extraordinary and max fun was about to came on Sunday !!! The SRW comunitty WOW , webchat was full of the greatest SRW players (just a bit side question : DID U EVER ASK ONE OF SRW ALIENS FOR HELP AND THEY REFUZED YOU ?) - my answer in NEVER and i bet yours too. So it was a privilage to race amongs them. 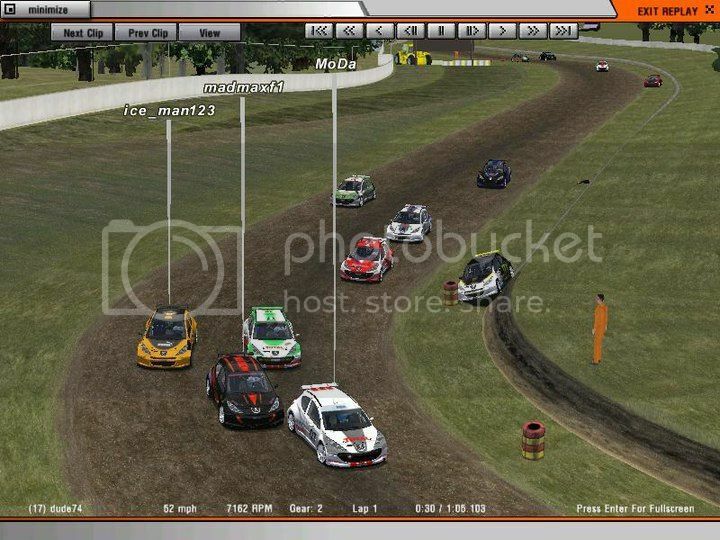 i miss : Coss organizing all that, being THE MARSHALL and running all smooth even if on some bery though situation and trying to give everyone a fairplay situation, the passion of Coss for simracing JUST off the roof !!! i miss : as childish as it seems that simple message : " 700-900 B, 700-900 A, 900-1100B following drivers get ready "
Also, one quick idea: why don't we all buy something with cash this week? It doesn't matter if it's $3 or $25, it's just to show to SRW people that we are still here, and that we won't give up. I'm saving my money for the NEXT SUNDAY CHAMPIONSHIP to buy the needed cars. But reading the other posts I remembered other things, like the excitemente I had doing the hotlaps for SRO's, trying to be the first in the grid, and the good old live races... There's so much about it... the overtakes, the close races, the battles with friends and the new people we met, I mean, everything! And there was a time when I did the livestreams and I remember that it was an awesome oppurtunity! Reading through your posts and especially all those great memories that you shared, makes me very emotional. I'm honoured to see it all. That's exactly why we've pushed so hard, especially during the past 2 years. As promised, I will give you all a better insight on that later on, but for now: fully focused on the current situation. So what is the current situation? To put it shortly: around the time of May, a will to continue supporting of the online area has been dropped. I continued on my own from June and on, hoping that it's just a nightmare that will eventually end. It kind of did, just a couple weeks ago, but I'm still not fully woken up. Hope you get my metaphor. There are plans for the future, as usual, but there is no plan at all for the current, online area of Simraceway. Me and Simon, so the two most engaged members of the team (leaders of the entire project between middle of 2013 and May 2015), have a very strong will to continue taking a good care of it and will be discussing these topics during the following days. Regarding the events, please continue to be patient. With you all the way on this Coss. Good Luck. I had enough of F1 2013 and I looked for something else. 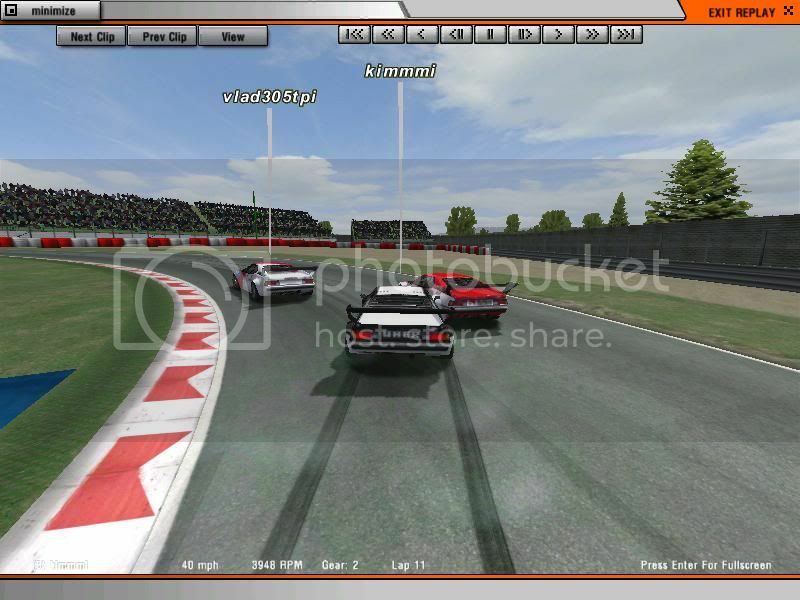 I joined SRW in 2013 having heard about the game from RaceDepartment.com. I didn't expect much from the game at the start, but it turned up to be a big and positive surprise! A fantastic game and a great community in it. My studies and getting Assetto Corsa as a present kept me away from the game and I came back this summer. What I miss? Racing with lots, really lots of people in many different events. Now you sadly have to go where the others are because there are not many players. Cheers to you Coss and to Simon also. I know you guys will do everything in your power bring the life back to SRW. At least you guys have your eggs firmly sat in your pants!